Arsenal winger, Alex Iwobi believes the criticisms he has received this season will only spur him on to become a better player. The Nigeria international has come under fire occasionally this campaign for perceived under-performance, a clear example been after the 3-1 loss at Manchester City in the Premier League last weekend. Speaking to Arsenal Player ahead of their trip to the American Express stadium to face Huddersfield Town on Saturday, the Super Eagles star revealed his utmost concern was to see the team perform well and win games irrespective of whether his outputs are recognized or not. "I would say each day I'm still growing and still learning, but negatives, obviously they're always going to criticise me for my goals and assists, which I need to add to my game if I want to be compared with the people I'm playing with", he said. "I have an analyst now who is always trying to help me, which I didn't have in seasons before, so he's sending me clips and saying what I can do better. "That's helped me and I'd like to say I've been involved in a few goals this season, even it's not the assist or the goal, I've been getting a few pre-assists which go unnoticed. But at the end of the day as long as the team does well, that's my main concern." 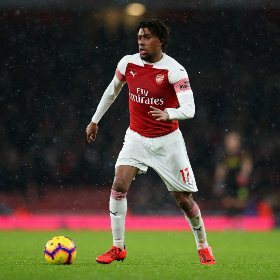 Iwobi has featured in 22 of his side's 25 topflight games this season and will earn his 87th Premier League appearance if he gets to taste action versus Town.